What you see when you look at something depends not so much on what is there in front of you, but more the assumption you make when you look at it. Nothing is positive or negative, good or bad, it just is. It is the meaning that we give the situation that gives it the power. Giving power or attention to the negative will activate the negative polarity in your brain cells and put you in a negative state. When you’re in a negative state you can only attract to you negative conditions and circumstances. There is a law that states “like energy attracts like energy”. Therefore you should avoid giving power or attention to the negative and focus your energy on the positive so you can attract good and positive conditions in your life. Train your Mind to habitually think in a positive manner and you will feel really good, the petty things that used to bother you will “fall away”. You will start to repel the negative. This doesn’t mean you won’t ever feel negative but you will be able to more quickly shift out of your negative attitude. Emotions are energy in motion, they are a force that move you into action or stop you from taking action, and it’s our actions that cause a reaction or what we may call our results. You may be thinking “I am positive but I am surrounded by people who are so negative”. If this is your situation, then you may not particularly enjoy what I am going to say next. It is your attitude of mind that needs to change. 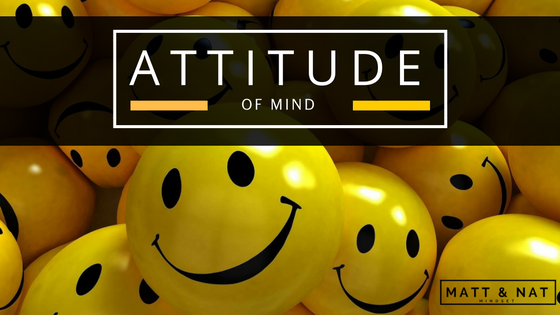 It wasn’t that long ago that I was stuck in a certain situation and my mentor Bob Proctor said “work on your attitude… it’s EVERYTHING!”. As always, he was right on the money! Change your perception or attitude towards the outside world and the outside world will respond in a like manner. Do you find yourself having negative mental conversations with people who bother you, telling them exactly what you think of them in a way that you wouldn’t normally tell them in person? Are you mentally discussing a negative situation that hasn’t happened yet with your peers? We all do this in some way, using our wonderful imagination we play out scenarios or situations in our mind and then they are played out in reality. They may not play out exactly as you saw it but the end results are the same. The thing is, you are conditioned to play out negative scenarios in your mind, and the more intense you feel during this mental scenario, the more power you give to it. Now that you are aware of this habitual way of thinking you can stop yourself from fulfilling these negative thought patterns. Start seeing yourself in your minds eye having wonderful conversations that leave you feeling really good. You can consciously do this at different stages of the day. Set aside 5-10 minutes, a couple times a day to relax and imagine a situation the way you want it to be. Whether that’s getting a promotion, winning a sporting event or having someone tell you how great you look. It can be absolutely anything! You are the creator of your life, you choose. Remember this point: It is your persistent assumptions that determine the behaviour and attitude of the world towards you. You are in control. If you found this article helpful please like, comment and share it with anyone you feel could benefit from it.